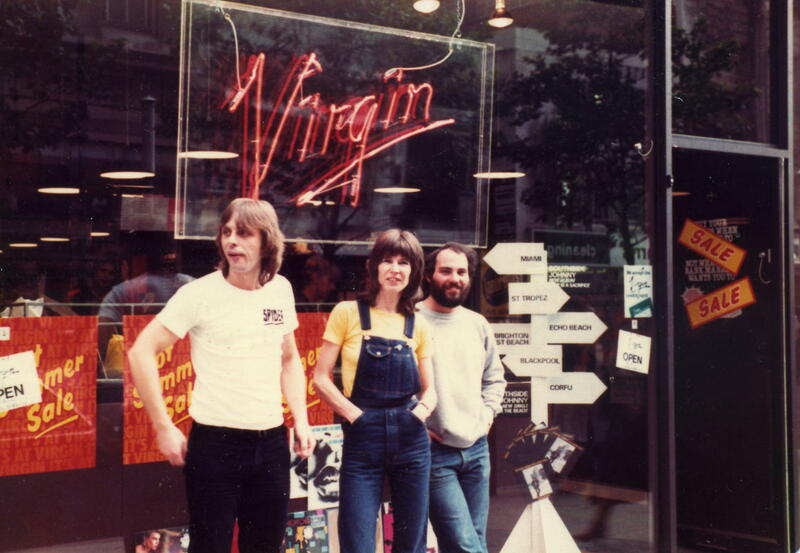 Paul Dolman, Carole Clarke and Phil Middleton outside Virgin Records, July 1980. Photo sent in by Phil. I remember the shop in Corporation Street…amazing..used to step over people sitting on the floor. coolest place around. I remember the shop in Corporation Street as well. On one occasion went there in 1990?? to get the new TYR album signed by Black Sabbath mob. Anyone remember INFERNO RECORDS in Dale End opposite Hole in the Wall pub and next to Woodruffs Music Store (where Toys R Us were/are now). I went to a signing by Van Halen when they toured as support for Black Sabbath on their 10th year Anniversary World Tour. Got talking to Eddie Van Halen and hung around after the signing. He asked me if Woodruffs was any good and I said yeah but a bit expensive. Eddie said no probs lets go in. He tried out a few guitar effects and his soloing brought the shop to a complete stand still. He chose about 3 items that come to about £400 quid (which was a lot of money way back then). I can still see the expresion on the shop assistants face and hear his jaw drop when Eddie took out the biggest wad of cash I have ever seen and paid there and then outright in notes. Ah yes, the ORIGINAL Virgin in Birmingham. Sit in the ex aircraft seats, slip on the ‘phones and listen to whatever you wanted with no pressure to buy. They also had a nice line at one time in, shall we say, “unofficial” releases by Dylan, Stones etc. Of course headphones were a rarity in the home in those days (very early 70’s)so it would not be uncommon for someone to slip them on and then SHOUT at the top of their voices such comments as “THIS AIN’T THE FUC*IN ‘OO” etc. There again, some people still do that with their Ipod’s. I remember going in the store in 72/73 when I was at St Peter’s College, Saltley. Trying to track down Barry from the record shop downstairs in oasis market.or paul from the origional virgin records shop dressed 60,s style. Hi, just found comments reference the birmingham virgin records shop. There was a guy who worked there in early-mid seventies who’s name was Paul Dolman?? Paul and I and Sue Bradley and Phil Middleton and Jon Webber opened up the Bull Street Virgin. Paul was a good man and I am so sorry to hear he has passed. Hi,I am trying to find anyone from Woodruffs music shop that can tell me anything about Frontier Guitars.My thanks in advance Martin. I discovered Virgin Records in 1971, which was probably shortly after it opened. I visited almost every Saturday until it closed (1976?) and moved into Bull Street. The original store was a great place for freaks to hang out, listen to music and make friends. I hated the Bull Street store. They had security guards who wore suits! Ugh! After that Virgin moved into the even bigger store on the corner of Corporation Street and Bull Street, which was even worse. I miss the original store. Are the salespeople still around? I can’t remember the names. Two guys and a girl. Just replying to your comment, Paul Dolman used to work at the original Virgin record store. He was to married to Lynn. Also worked with somebody else but I don’t know any names. Paul was Manager at The Bull Street Store and was not married at the Time of the “Opening” I worked with Paul and the others names were Phil Middleton Jon Webber and Sue Bradley (1979 era) We also had Ron and Jude who did the shrink Wrap on the “Albums” I hosted the BRMB Booth inside the Store and organized trips through the Radio Station with Robin Valk and hosted Personal Appearances from Visiting musicians promoting their New releases and also did the cashing out at the end of the day. I worked at the original ‘black cavern’ Corporation Street through the school summer holidays and weekends from 71 onwards for a few years. Paul Dolman was kind, gracious and immensely knowledgable about music which was a challenge then. Remember meeting Richard Branson once simply introduced as ‘Richard’ by Paul – they looked quite similar then and were somtimes mistaken for brothers. In I think 1963 I purchased a silver ludwick. Drum set to join Terry Webb and The Spyders in redditch just after John Bonham left them from them, happy days! Spent many an hour in there at the back corner (downstairs?) watching two friends aim for the high score on Space Invaders. In the early days it was the only decent record store to get rock stuff. I bought about 5 Sabbath albums in one go from there as they were on special offer. I remember the space invaders machine in the original virgin store, great times. Good music .I remember greyhound records being in close encounters in birmingham by the market.I still have a record signed by rusty lee!! Virgin Records-MY GOD! I used to go here nearly every weekend.My my Wilf worked in the shop at one time.Got a Faust album which I think I still have,also bought Cream “Heavy Cream” which I know I’ve still got,and could swear I was sold it by Richard Branson! I’m sure someone can confirm if this would be true.Hey Ho! If so tell him I said hi. Not impossible but unlikely. I worked there during the summer holidays and weekends from 1971 for a couple of years on and off and lots of people mistook Paul Dolman, the manger for Richard Branson. Back then they looked quite similar and many people thought they were brothers. From my recollection Richard was an infrequent visitor and it was usually fleeting. Remember the 50p albums by Faust and Camembert Electrique? “Faust Tapes” was 50p. “Camembert Electrique” (by Gong) was normal price. I bought both of them. I do indeed and have both. Also have the original transparent Faust album – an advantage of working there! I also have original Lynard Skynard and Allman Brothers imports before the were released on U.K labels. I worked at the Corporation Street store from late 88 until late 90 (Moved to Cardiff store for 4 years). Carol Clarke was my store manager. Assistant Managers were John Hogg and Simon Lambert. Sheila Egan was my line manager, she was the Cassette Buyer! The counter on the ground floor was shared between cassettes and Videos (run by Tracey Mullins). Up a couple of steps towards the back was the CD dept (run by Steve Fowler). Upstairs was the LP section (Mark Hudson) and Singles dept. We also had a coffee shop and an Athena upstairs. The shrinkroom was a great place to be, always great music on the turntable in there! Other names I remember from that time: Chris Long, Paul Bytheway, Dean Baker, Roger Ellis, Carl Vincent, Tony Kane, Laura johnson and Paul Florence. There were three girls working in the Cash Office, I can picture then, but can’t remember their names….I think one with short dark hair was called Sarah. We had a DJ called Steve, who spent most of his time with Steve Fowler eyeing up all the women! John Hogg left, to help out with the opening of stores in Belfast and Hong Kong (I think). He was replaced by Nigel Holmes who became manager of the Cardiff store and offered me a job there. I of course remember you well Carl, sarah pettigrew and Eleanor were two of the girls in the office .Me and john hassell were going to work in the hong kong store under john hogg but it all fell through when hmv beat them to the site.Also there was Darren wall on singles with Dean baker and sarah lovesy and lynda byard in the cash office. The original shop was a great place, we heard the Montrose 1st album there and bought it, great record, also i remember they had TV Screens and one Sat being absolutely transfixed watching Joe Walsh with his band playing “turn to Stone” Magic stuff and vintage Joe. Hi back to you Sarah. Still blonde but not the rest any more! I remember two guys and a girl from my visits to the Corporation Street Virgin store. That was the original store. (I notice that some other people who’ve commented refer to the Bull Street store as the original store, probably because they’re too young to know better). I only visited on Saturday from 1971 to 1974, so the girl must have been you, Sarah. Short brown hair? One of the guys had long blond hair, the other had dark hair, not quite as long. From 1974 to 1976 I visited on other days. I think it was 1976 when you closed, do you remember exactly? There was a brief overlap when both stores (Corporation Street and Bull Street) were open at the same time. I remember complaining to the blond guy about the horrible new store, and he told me, “Don’t worry, we won’t close”. But a couple of weeks later they were gone. I never saw the Corporation Street staff in the Bull Street store. Were they fired or hidden in the basement? I just reread my comments and realised that I might have insulted people by calling the Bull Street store “horrible”. Sorry, I meant no insults to any of the staff, that’s just typical for my brash direct way of talking. I shopped frequently at the Bull Street store for years, and I admit that it had a bigger selection of music and better listening facilities than the original store. What I found “horrible” about the store was the first impression when I walked in: men in suits. That offended my sensibilities as a hippy. I grudgingly accept the necessity of security guards — not everyone is as honest as me — but couldn’t Virgin have hired some long-haired freaks to stand at the door? Was this in the original store next to the Law Courts at the far end of Corporation Street? This was a great shop. I saw the Shakin Pyramids play there in circa 1980 and had an LP signed by Link Wray and Robert Gordon around the same time. Fantastic photo!…We run a Facebook site dedicated to Virgin Records in the 70s…I have taken the liberty of adding your post to the site…this is right up our street! 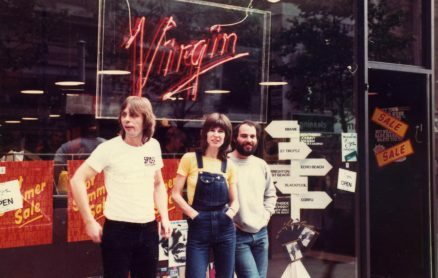 I joined Virgin in 1978 (after being interviewed by Tim Stratton-Clarke who comments above – hello Tim) and spent the first few months working in various shops around the country, the first being 6-8 weeks in Birmingham. Paul was the manager (and a very nice man he was too). At that time Phil was running the singles section downstairs with Ron(?). The other people I can recall were Sheenagh (who I subsequently worked with in Cardiff), Maggie (who I think ended up in Cardiff too) and Vicky. It was a fun place to work and a great bunch of people. We got to go to some great gigs – I can remember Robert Palmer at the Odeon and the Stiff tour at Aston University as being particularly memorable. Thanks for that Gillian, very sad he died so young. I helped him open the original shop in Corporation St as I was manager of the Liverpool Shop at the time. Lovely man. Great shop. It’s where I bought my Tubular Bells. Terrible pressing but I was thrilled. And you could never be sure of the opening time. Are there no pictures of the shop front? I have been looking but can’t find any. My memories? Buying records very occasionally there at 14 (who had money at 14 in those days?) but I did get Dr Feelgood’s ‘down by the jetty’ from there courtesy of my uncle….and getting tickets to see The Who at Bingley hall from there in 1975. Everyone else in the queue seemed much older and taller than me!